Groundwater is used in many ways, across all parts of the country. 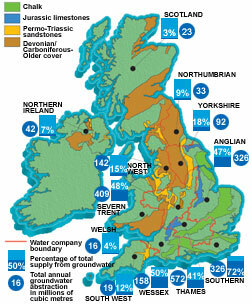 In the South East of England the majority of public water supply is pumped from aquifers. In other areas of the UK groundwater also provides substantial proportions of water supply, even in the wettest parts of the country. Groundwater is readily availabile and generally reliable and of good quality, making it the best option for supplying smaller communities. Groundwater is particularly important in East Anglia, where it is used for irrigation during dry summers, improving crop yields. Groundwater is used by industry almost everywhere in the UK, especially in large conurbations such as London, Birmingham, Liverpool and Manchester. Some industries, such as brewing, need groundwater with particular chemical characteristics - for instance the water in Burton upon Trent is particularly suited for brewing beer. Our major aquifers are the Chalk, Jurassic Limestones and Permo-Triassic sandstones, with substantial supplies available from other formations, such as river gravels and Carboniferous Limestone. Over recent years many groundwaters have been bottled for sale as mineral waters. Often these waters come from minor aquifers in upland areas where distinctive geology imparts interesting flavours.